Music of Reality transported an audience from their seats in Alfred L. Morse Auditorium Friday to the vibrant underwater world of colorful reefs, black anemones and deep whale calls with strokes of piano keys and plucks of a cellist. 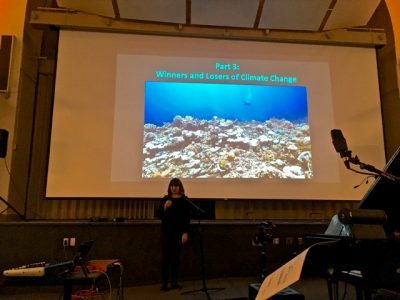 Sarah Davies, assistant professor of biology at Boston University, inspired the concert that was titled “Reef Music” with her research, according to the BU event page. Ibbett said that a lecture is structured similarly to a musical composition, and Vastek added that, like scientists, artists are looking for a way to answer a problem. Ibbett’s father was a scientist, so he said he grew up around science. As a musician, he “always wanted to find a way to put those passions together,” he said. Ibbett said Vastek always sought to present music to an audience in new and unique ways and tried to implement this in Music of Reality. “We try to create an environment where people are not just switched on with their minds, but they’re switched on with their whole person,” Ibbett said. The music selections and compositions paired with Davies’ discussion of coral, and the format of the concert was unlike a typical research presentation. Before the show began, unmodified field recordings of the ocean taken from Curaçao’s reef played. Following Davies’ talks, Sabrina Sadique spoke an original poem entitled “Falling from the Fells into the Reef: The Cry of the Coral,” which recounted what she believed coral would wish to say to a human. The show ended with a 20-minute performance of George Crumb’s “Vox Balaenae,” where the musicians each wore black masquerade masks and the room was dimmed. According to Ibbett, the dimmed lights helped ease attendees into a peaceful mental state. Julie Klinger, assistant professor in the Pardee School of Global Studies, spoke highly of the show. “[I’m] gushing because [I] had never experienced music or science in this way,” Klinger said. Davies said she has been a coral biologist for 12 years, but she prefers to use the term “coral hobbyist,” she said in the lecture. She explained that she first became interested in this work through scuba diving and sailing. During the lecture, Davies described the structure of coral, explaining how they act as animals, plants and rocks all at once. She also described their process of reproduction and how they live in a symbiotic relationship with algae. She next focused on coral bleaching, which occurs when coral are stressed by a change in conditions and expel algae from themselves, thus turning white. Bleaching is becoming more and more common as the oceans continue to warm, leaving no time for the reefs to recover. Since 1969, the top 2,300 feet of oceans have warmed more than 0.4 degrees Fahrenheit. The audience saw side-by-side images that Davies showed of the same reef in different years where one is healthy and the next is dead. Davies also explored ways in which coral are beneficial. She said they protect humans from the impact of hurricanes, provide economic and ecological benefit and other potential societal benefits that we may have now lost out on the chance to discover. “Reefs will be there, but they’re going to be fundamentally different than we know them today,” Davies said in the talk. Music of Reality is donating 10 percent of the revenue from the “Reef Music” concert to the Coral Restoration Consortium. No matter their background, Vastek said everyone “can get something unique out of the event.” She described how each individual will pick up different aspects of the show than the next person. CORRECTION: A previous version of this article misstated a word in the poem “Falling from the Fells into the Reef: The Cry of the Coral.” An updated version of the article states the correct word.